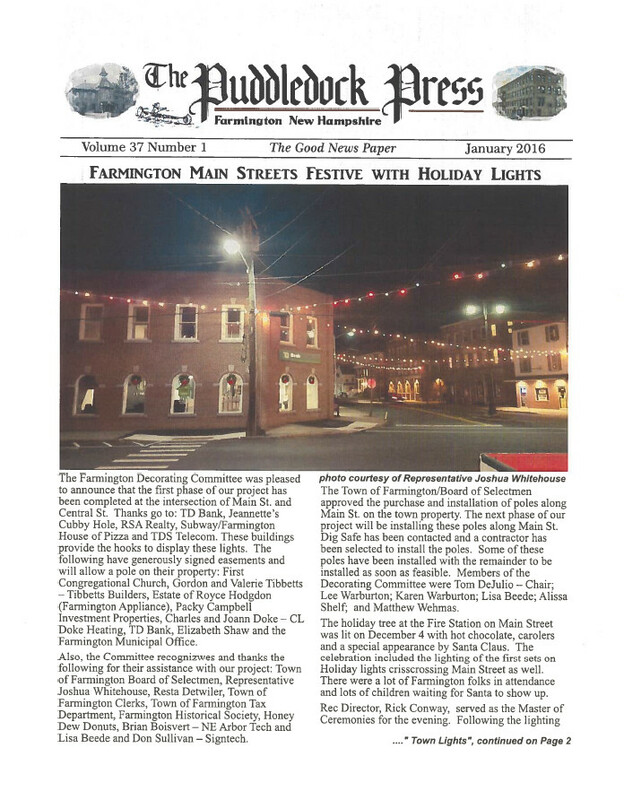 The January issue has been posted on the Farmington Historical Society's Scribd site, and is now available for viewing online. You can view and download and print the issue in color from the Scribd site, if you wish. Printed hard copies of the January issue have been distributed and are now available at all our fine distribution sites in Farmington. 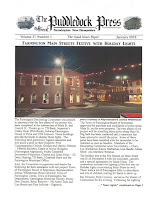 To find out where to pick up your printed hard copy, check the Find a Puddledock tab on this site, and select Current Edition for the list of our fine Farmington b usinesses that carry the Puddledock Press! Don't forget to thank these establishments for carrying the Puddledock, visit them often, and remind them how you appreciate their supporting our paper, and that you'd love to see them advertise in the paper! Hope you enjoy the January issue! Start submitting your news and articles for January issue now. Editor's Note: The front page story has incorrectly spelled a person's name. The press release listed Decorating Committee members, and those names were printed in the paper. Alicia Schuff is on the Farmington Decorating Committee. All apologies.